Not since the days that Ronald Reagan was in office have I paid as much attention to the potential of nuclear war as I do now. In the ’80s, the thermostat on the Cold War was set at below zero and headlines were filled with talk of a Continued and a cigar dating sites. 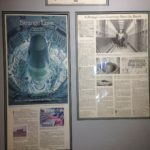 It was also a time of heightened activism supporting nuclear disarmament and the television movie “The Day After” depicting the horrors of nuclear war. But it all felt unreal and remote to me then. Consider the headlines about North Korea and its numerous test-fired missiles, which now appear to be within reach of Chicago and other major U.S. cities. The Doomsday Clock is set at two and a half minutes to midnight, the closest the world has been to calamity since 1953. All of this has given rise to a growing interest in ways to survive a nuclear war, to which I can only ask: Are you serious or delirious? The idea of surviving a nuclear holocaust – or more accurately, the desire to want to survive one – is pure folly. Think about it: You would live in a confined space, eat canned rations and be unsure when it would be safe to surface. That is certainly not living. It’s barely surviving. And for what? So you can face victims of radiation poisoning and burns, the catastrophic loss of life, the destruction of cities and an end to civilization as we know it? It’s not an unfounded worry. 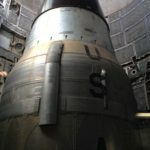 There’s plenty of firepower to blow us all to kingdom come: Nine countries collectively have 14,900 nuclear weapons, the vast majority in the hands of the United States and Russia, according to Ploughshares Fund, a nonprofit dedicated to reducing nuclear threats. According to the website NukeMap, if the “Tsar Bomba,” the largest Russian bomb tested, was dropped on New York City, it could kill 7.6 million people and injure 4.2 million. The fallout could affect millions more. Not to be too cavalier and macabre about it, but I’d rather be right at ground zero and annihilated in the first seconds of a blast than be among those left to try to pick up the pieces. 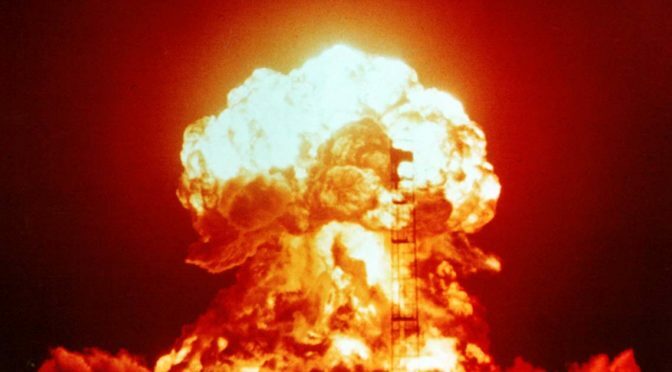 The thinking about surviving a nuclear blast dates back to right after World War II. A website called Old Pics Archive has a collection of photos of bomb shelters from yesteryear, including one with a happy couple on their honeymoon! It examines the elaborate plans to ensure the continuity of government in the event of nuclear war. The plans include numerous secret bunkers to house the president and other leaders and, among other things, a stash of $2 billion in cash, much of it in $2 bills, because, well, you know, I guess money will still have value after the landscape is vaporized. More recently, CNN reports that Rising S Company, which makes doomsday bunkers, said 2016 sales for its custom-made underground bunkers increased 700 percent from 2015, and overall sales increased 300 percent since the presidential election in November. Those investing in these doomsday bunkers have more hope about life after death (and destruction) than I do. 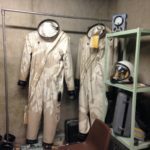 ​​For an idea of where the end of the world might start, visit the Titan II Missile Museum in Sahuarita, Az. 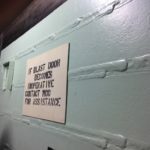 The site is a former missile silo, complete with a disarmed Titan II still intact, 35 feet below ground in a steel-and-concrete-reinforced bunker. It is a sobering reminder of the destructive power of man and how MAD — as in Mutually Assured Destruction — those Cold War days were. I was born two years after the Cuban missile crisis and did not grow up with those “duck-and-cover” films about what to do if a thermonuclear bomb went off. But I do recall drills where we gathered in the hallways in school and sat with our backs to the wall. And I remember distinctly the school basement and many of the basements of the Bronx apartment buildings in my neighborhood displaying the three upside-down yellow triangles against a black circle that indicated the location of a fallout shelter. I remember not knowing what a fallout shelter was but it was clear it was something important and official. Fast-forward to when I was in high school and college and Ronald Reagan was president. 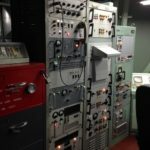 It felt like we were on the brink of nuclear war as we (America) and our longtime nemesis, the USSR, were locked in an arms race that would have no winner. It was after the breakup ​of the USSR that I felt some of that threat recede. But the visit to the museum brought those chilling thoughts right back. And this was certainly no Hollywood set. 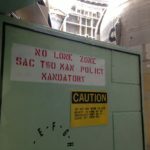 The artifacts include​d​ consoles with buttons, dials and lights and stenciled signs warning that certain areas were “no lone zones,” meaning it was mandatory that two airmen (or women) be present to ensure that someone was always watching out for the other person. “The Titan II was capable of launching from its underground silo in 58 seconds and could deliver a nine-megaton thermonuclear warhead to its target more than 6,300 miles (10,000 km) away in less than 30 minutes. 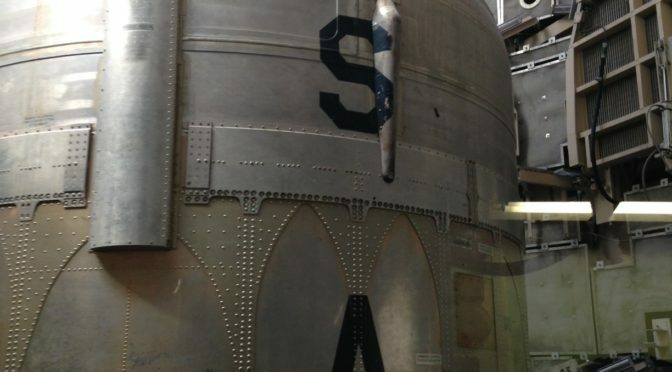 While the museum ​tour guides preached strength through deterrence a bit too much for my liking, there was no denying the impressive engineering and discipline that went into building and maintaining silos like these across the country. Still, it was unsettling to consider one of these missiles being used, much less dozens. Thinking today about rogue nations test-firing missiles or building an arsenal is even more unsettling. When we left the museum, we drove 20 miles to the San Xavier Mission Church Del Bac, which was built in the 1700s. It boasts of being the oldest intact European structure in Arizona and continues its mission of ministering to the needs of its parishioners.